17 November 2014, at 12:20a.m. 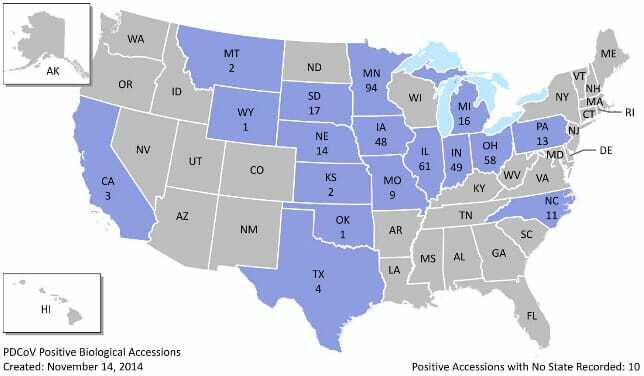 US - There were two new positive results for Porcine Delta Corona virus (PDCoV) detected in the US in the last week, bringing the total number of positive samples so far to 413 in 17 states. For the latest weekly report – for the week of 2 November in a report dated 12 November from the USDA Animal Health Inspection Service and made available by the American Association of Swine Veterinarians (AASV) – two pig farms (termed "swine accessions") have tested positive for the PDCoV. Both positive samples were from Minnesota. The cumulative total now stands at 413. The report notes that testing data from Iowa State University Veterinary Diagnostic Laboratory were not available for inclusion in this weekly report. The National Animal Health Laboratory Network (NAHLN) began collating testing data on PDCoV for the week of 30 March 2014. So far, 8,817 accessions have been tested, 302 in the most recent week reported, so the overall percentage found positive is 4.7 per cent. The total number of states affected remains at 17 (Table 1 and Figure 1). as the distinct number of accessions tested rather than the sum of accessions tested by week. PDCoV was previously known as Swine Delta Corona virus (SDCv). It is related and causes similar effects to the virus that causes Porcine Epidemic Diarrhoea (PED). Critical notes about these data are provided at the end of the original report from AASV.